4 pin Neutrik Speakon connector mounted horizontally on a dual face wall plate. Fitted with 4.8mm spade terminal connections for quick and easy connection on site. 4 pin Neutrik Speakon connector mounted horizontally on a dual face wall plate. Fitted with 4.8mm spade terminal connections for quick and easy connection on site. Black version of C 0459. Wallplate fitted with DE9 connector. Rear connections are via screw terminals. 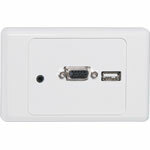 Wallplate fitted with VGA connector. Rear connections are via screw terminals. Terminal type VGA Plates are fitted with dual HD9 female VGA connectors. 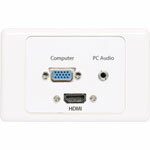 Supplied with both Clipsal and HPM Front faceplates. Flylead Type VGA Plates are fitted with dual HD9 female VGA connectors. Supplied with both Clipsal and HPM Front faceplates. 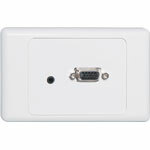 Screw Terminal Type VGA Plates are fitted with HD9 female VGA connector & 3.5mm audio. 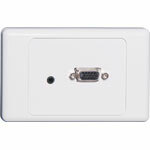 Includes PCB mounted terminal block connector for easy on-site termination. 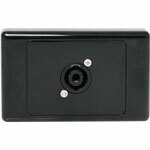 Supplied with both Clipsal and HPM Front faceplates. 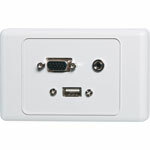 Wallplate fitted with VGA, 3.5mm audio & USB connector. Rear connections for VGA and 3.5mm audio are via screw terminals. 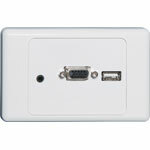 Wallplate fitted with VGA, 3.5mm audio & USB connector. Rear connections are via back to back plugs, suitable for direct connection to terminated leads. 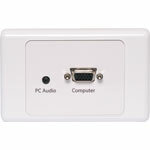 Flylead Type VGA Plates are fitted with HD9 female VGA connector & 3.5mm audio. Supplied with both Clipsal and HPM Front faceplates. Fly lead model fitted with 150mm lead and connectors. Supplied with two facia covers to suit your decor. 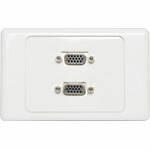 Flylead Type VGA Plates are fitted with HD9 female VGA connector, HDMI & 3.5mm audio. 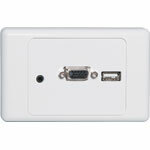 Supplied with both Clipsal and HPM Front faceplates.